Brucella spp. are Gram-negative bacteria that behave as facultative intracellular parasites of a variety of mammals. This genus includes smooth (S) and rough (R) species that carry S and R lipopolysaccharides (LPS), respectively. S-LPS is a virulence factor, and mutants affected in the S-LPS O-polysaccharide (R mutants), core oligosaccharide or both show attenuation. However, B. ovis is naturally R and is virulent in sheep. We studied the role of B. ovis LPS in virulence by mutating the orthologues of wadA, wadB and wadC, three genes known to encode LPS core glycosyltransferases in S brucellae. When mapped with antibodies to outer membrane proteins (Omps) and R-LPS, wadB and wadC mutants displayed defects in LPS structure and outer membrane topology but inactivation of wadA had little or no effect. Consistent with these observations, the wadB and wadC but not the wadA mutants were attenuated in mice. When tested as vaccines, the wadB and wadC mutants protected mice against B. ovis challenge. The results demonstrate that the LPS core is a structure essential for survival in vivo not only of S brucellae but also of a naturally R Brucella pathogenic species, and they confirm our previous hypothesis that the Brucella LPS core is a target for vaccine development. Since vaccine B. melitensis Rev 1 is S and thus interferes in serological testing for S brucellae, wadB mutant represents a candidate vaccine to be evaluated against B. ovis infection of sheep suitable for areas free of B. melitensis. Brucellosis is a worldwide extended infectious disease caused by the Gram-negative bacteria of the genus Brucella. This genus includes several species among which B. abortus preferentially infects cattle, B. suis swine and wild-life and B. melitensis goats and sheep. These three species are zoonotic and cause a grave and debilitating disease in humans. Sheep can also be infected by B. ovis, a non-zoonotic species. B. ovis brucellosis is characterized by a decreased fertility in rams, occasional abortions and a rise in perinatal mortality [,]. These four Brucella species differ not only in host range and pathogenicity but also in surface characteristics. Whereas B. abortus, B. melitensis and B. suis carry a smooth (S) type lipopolysaccharide (LPS) in the outer membrane, B. ovis LPS lacks the O-polysaccharide typical of S-LPS and thus resembles in this feature the rough (R) LPS mutants of S brucellae []. S-LPS is a major virulence factor of S Brucella species []. In this molecule, the O-polysaccharide is linked to a core oligosaccharide, which in turn is linked to the lipid A. It has been known for decades that the O-polysaccharide is essential in the virulence of B. abortus, B. melitensis and B. suis, and that the lipid A is poorly recognized by innate immunity []. In addition, the core oligosaccharide section has been shown recently to hamper recognition by innate immunity systems, including complement, bactericidal peptides and the TLR4-MD2 complex []. It has been postulated that the Brucella S-LPS core carries a lateral branch that hinders access of innate immunity effector proteins and receptors to the inner sections of the core and lipid A [–], and the existence of a branched structure has been confirmed by structural analysis (Figure 1) []. These findings have opened the way for an analysis of the role of the LPS of R Brucella species in virulence. Moreover, as delayed recognition by innate immunity plays a major role in Brucella virulence, core mutants represent candidates for the development of vaccines triggering an early and thus protective immunoresponse []. Proposed structure of the Brucella core LPS as described by Kubler-Kielb []. The core oligosaccharide is composed of a side oligosaccharide chain composed of four residues of glucosamine (GlcN), plus glucose (Glc) and mannose (Man), the latter linked to Kdo I, with Kdo II linked to another glucose from which the O-polysaccharide stems. Quin: quinovosamine; Per: perosamine. Sheep brucellosis caused by either B. melitensis or B. ovis can be controlled by vaccination with the attenuated strain B. melitensis Rev 1 and, in fact, this is the only effective way to control sheep brucellosis in areas with a high or moderate prevalence of the disease []. However, Rev 1 has several drawbacks: it causes an antibody response interfering with the serological diagnosis of B. melitensis, is virulent in humans and resistant to streptomycin, an antibiotic of choice for brucellosis treatment []. Therefore, Rev 1 is forbidden in countries where B. melitensis has been eradicated [], which leads to the increase of B. ovis infections in sheep. Thus, research on B. ovis-specific vaccines is an area of intense research [–]. Acellular vaccines can be an alternative, and attempts have been carried out with whole cell and subcellular extracts [], recombinant proteins [] or DNA vaccines []. However, these strategies usually require boosters and adjuvants or immune modulators to reach an adequate Th1 response [,], with the ensuing increase in costs and difficulties of implementation in extensively bred sheep. The purpose of the research reported here was twofold: to study the involvement of LPS in B. ovis virulence and to develop B. ovis-specific vaccine candidates that could overcome the above-summarized drawbacks. To this end, we built on previous genetic analyses that have shown that at least three glycosyltransferases (wadA, wadB and wadC) are necessary for the complete assembly of the core oligosaccharide of B. abortus and B. melitensis [,,,]. The bacterial strains and plasmids used in this work are listed in Table 1. The parental strain B. ovis PA is a virulent strain isolated from a naturally infected ram that has been extensively used as a challenge for the evaluation of B. ovis vaccines in rams and mice. B. ovis strains were cultured on tryptic soy agar (TSA, Pronadisa, Madrid, Spain) or in tryptic soy broth (TSB, Biomerieux, Madrid, Spain) supplemented with 0.5% yeast extract (YE, Merck, Madrid, Spain) or on Blood Agar Base No. 2 (BAB; Pronadisa), all supplemented with 5% porcine or calf serum (TSA-YE-S, TSB-YE-S or BAB-S, respectively). Incubations were performed at 37 °C in a 10% CO2 atmosphere, and liquid cultures were shaken at low intensity. E. coli was grown in Luria-Bertani broth (LB: Becton Dickinson, Madrid, Spain). Nalidixic acid (Nal; 25 μg/mL), Kanamycin (Km; 50 μg/mL), Gentamicin (Gm; 15 μg/mL) or sucrose (5% w/v) (all from Sigma-Aldrich Ltd., Haverhill, United Kingdom) were used when required. CITA, Centro de investigación y tecnología agroalimentaria; UN, Universidad de Navarra. Plasmid and genomic DNA were isolated with Qiaprep Miniprep (Qiagen GmbH, Hilden, Germany) and Ultraclean Microbial DNA Isolation Kit (MoBio Laboratories, Carlsbad, CA, USA), respectively. When needed, DNA was also purified from agarose gels using a Qiack Gel extraction kit (Qiagen). DNA sequencing was performed by the dideoxy method at the Sequencing Unit of Centro de Investigación Médica Aplicada (CIMA, Universidad de Navarra, Spain), and primers were synthesized by Sigma-Aldrich Ltd. Searches for DNA and protein homologies were carried out using the Kyoto Encyclopedia of Genes and Genomes [], EMBL-European Bioinformatics Institute server [] and National Center for Biotechnology Information (NCBI) database []. In-frame deletion mutants on selected genes were constructed by PCR overlap using genomic DNA of B. ovis PA as a DNA template. Primers were designed based on the sequence of B. ovis ATCC 25840 (also known as 63/290 or NCTC10512; accession numbers NC_009505.1 and NC_009504.1). They are listed in Table 2. For inactivation of wadC (BOV_1453), we first generated two PCR fragments: the 5′end of the gene BOV_1453 was amplified with primers wadC-F1 and wadC-R2 obtaining a 473-bp fragment including codons 1 to 16 of the wadC ORF, as well as 424-bp upstream of the wadC start codon; whereas the 3′end was amplified with primers wadC-F3 and wadC-R4 obtaining a 481-bp fragment including codons 307 to 355 of the wadC ORF and 315-bp downstream of the wadC stop codon. Both fragments were ligated by overlapping PCR using primers wadC-F1 and wadC-R4. The resulting fragments containing the wadC deletion allele, was cloned into pCR2.1 vector to generate plasmids pYRI-14 (Table 1), sequenced to ensure the maintenance of the reading frame, and subsequently subcloned into the BamH I and the Xba I sites of the suicide plasmid pJQK. The resulting mutator plasmid (pYRI-15, Table 1) was introduced in B. ovis PA by conjugation using E. coli S17-1λpir. The first recombination event (integration of the suicide vector in the chromosome) was selected by Nal and Km resistance, and the second (excision of the mutator plasmid leading to the deletion mutant strain by allelic exchange) by Nal and sucrose resistance and Km sensitivity. The resulting colonies were screened by PCR with primers wadC-F1 and wadC-R4, which amplify a fragment of 934-bp in the mutant strain and a fragment of 1804-bp in the parental strain. An additional PCR was carried out to exclude the presence of the complete gene. The amplification was done with primers wadC-F1 and wadC-R5, which include a fragment from the deleted region of the gene. While strains carrying the complete gene amplified a 533-bp fragment, the mutant strain was unable to amplify the fragment (see Additional file 1). The deletion was confirmed by sequencing. As a result of the mutation 82% of the wadC ORF was lost, and the mutant strain was called BoΔwadC (Table 1). The ΔwadA mutant (BOV_0614) was obtained in a similar way. Briefly, primers wadA-F1 and wadA-R2 were used to amplify a 453-bp fragment including codon 1 to 57 of the 5′end of wadA (BOV_0614), as well as 284-bp upstream of the wadA start codon; and primers wadA-F3 and wadA-R4 were used to amplify a 460-bp fragment including codons 680 to 704 of the wadA ORF and 386-bp downstream of the wadA stop codon. Both fragments were ligated by overlapping PCR using primers wadA-F1 and wadA-R4, the resulting fragment was cloned into pCR2.1, sequenced and subcloned into pJQK. The resulting mutator plasmid (pYRI-13, Table 1) was introduced in B. ovis PA by electroporation with a micropulser (Bio-Rad, Hercules, CA, USA) as described before []. The first recombination event was selected by Km resistance, and the second by sucrose resistance and Km sensitivity. The resulting colonies were screened by PCR with primers wadA-F1 and wadA-R4, which amplify a fragment of 913-bp in the mutant strain and a fragment of 2782-bp in the parental strain. An additional PCR was carried out to exclude the presence of the complete gene. The amplification was done with primers wadA-F1 and wadA-R5, which include a fragment from the deleted region of the gene. While strains carrying the complete gene amplified a 565-bp fragment, no amplification was obtained with the mutant strain (see Additional file 1). The deletion was confirmed by sequencing. As a result of the mutation 82% of the wadA ORF was lost and the mutant strain was called BoΔwadA (Table 1). Taking into account that the wadB sequence of B. abortus 2308 and B. ovis PA are almost identical (99.86% homology with only one base pair change in the deleted section of the gene), we used the mutator plasmid pYRI-2 (Table 1) that was previously constructed to generate ΔwadB (BAB1_0351) mutants in B. abortus 2308 for the construction of the B. ovis ΔwadB mutant []. The mutator plasmid pYRI-2 was introduced in B. ovis PA by conjugation. The resulting colonies were screened by PCR with primers wadB-F1 and wadB-R4, which amplify a fragment of 570-bp in the mutant strain and a fragment of 1011-bp in the parental strain. An additional PCR was carried out to exclude the presence of the complete gene. The amplification was done with primers wadB-F1 and wadB-R5, which include a fragment from the deleted region of the gene. While strains carrying the complete gene amplified a 471-bp fragment, the mutant strain was unable to amplify the fragment (Additional file 1). The deletion was confirmed by sequencing. As a result of the mutation 60% of the wadB ORF was lost, and the mutant strain was called BoΔwadB (Table 1). In all mutagenesis experiments, after the second recombination, two type of colonies Nal and sucrose resistant and Km sensitive could be isolated: the deletion mutant strain and the strain that had reverted to the wild-type genotype (hereafter “sibling revertant strain”). The latter was also selected as control for additional mutations elsewhere in the chromosome that may have been acquired during the manipulations described above, and the genotypes of all the strains were confirmed by PCR amplification and sequencing of the target locus in the genome. Moreover, both mutant and sibling revertant strains were characterized following standard Brucella typing procedures [], and purity checked by inhibition of growth on BAB-S supplemented with Km. Extraction of whole-cell LPS by SDS-proteinase K protocol was performed as described by Dubray and Limet [] with modifications. Briefly, heat inactivated cells were suspended in 0.0625 M Tris–HCl buffer (pH 6.8) containing 2% SDS (wt/wt). Samples were heated at 100 °C for 10 min, and the lysates were tempered to 55 °C and digested twice with proteinase K (10 mg/mL, one hour at 55 °C). After that, samples were kept overnight at 20 °C and then stored at −20 °C. LPS were analysed in Tris-Tricine-HCl-glycine poliacrilamyde gel electrophoresis (Tricine SDS-PAGE) as described by Lesse []. Briefly, a 16 × 20 cm two-phase gel (18% acrylamide-bisacrylamide for the running gel and 4% for the stacking gel) was prepared in 1 M Tris 0.1% SDS, pH 8.45. The gel was placed between anode and cathode buffers (0.2 M Tris–HCl pH 8.9 and 0.2 M Tris–HCl, 0.1 M Tricine, 0.1% SDS pH 8.45, respectively) and the electrophoresis was carried out at constant voltage for one h at 30 V followed by 20 h at 70 V. LPS was stained by the periodate-alkaline silver method []. For Western blots, LPS was electrotransferred onto nitrocellulose membranes, blocked with 1% skimmed milk in PBS for 45 min and incubated with specific monoclonal antibodies (MAbs, see below) overnight. After washing, bound immunoglobulins were detected by chemiluminiscence (Thermo Fisher Scientific Inc., Waltham, USA) with goat anti mouse IgG (H + L) chain specific B. ovis conjugate secondary antibodies (Merk4Biosciencies, Damstadt, Germany). Outer membrane proteins (Omp) and LPS exposure on the cell surface was assessed by ELISA with the following MAbs: A76/08C03/G03 for Omp16, A76/05C10/A08 for Omp19, A68/25G05/A05, A68/15B06/C08 and A63/04D11/G01 for Omp2b, A59/05F01/C09 for Omp25, A59/10F09/G10 for Omp31, and A68/24G12/A08, A68/24D08/G09 and A68/10A06/B11 for R-LPS [–]. ELISA using whole bacteria as the antigen were performed as described previously [,] with some modifications. Briefly, lyophilized bacteria were resuspended up to OD600 1 in phosphate-buffered saline pH 7.4 (PBS). For coating, this suspension was distributed (100 μL/well) in 96 flat bottom plates (Thermo Scientific) and incubated overnight at room temperature. One-hundred microliters of MAbs (hybridoma supernatant diluted 1:3 in 0.05% Tween PBS) were incubated 37 °C for 1 h. Bound MAbs were then detected with an affinity-purified goat anti-mouse immunoglobulin G (H + L chains) – horseradish peroxidase conjugate (Bio-Rad, Hercules, CA, USA) (diluted 1:6000 in 0.05% Tween PBS) incubated for 1 h at room temperature. Between all the previous steps five washes with 250 μL 0.05% Tween PBS were performed in order to eliminate the excess of MAbs and conjugate. Enzyme activity was revealed by the addition of TMB ELISA peroxidase substrate (Interchim, Montlucon, France) and stopped after 20 min at room temperature with 1 M HCl based stop solution (Interchim). Plates were read at 450 nm with a microplate reader (Thermo Fisher Scientific Inc.). Autoagglutination capacity was evaluated by measuring the OD600 evolution of a bacterial suspension in TSB-YE-S, over 48 h of static incubation at room temperature, starting from initial readings of 0.8 (100% OD600) in TSB-YE-S []. The results were represented as the mean ± SD of the values obtained for three assays at each time point, in three independent assays. The surface charge density was measured as the electrophoretically effective potential (Zeta potential) []. For this, bacteria were inactivated with 0.5% phenol, washed and resuspended in 0.1 M KCl, 10 mM HEPES 10 mM (pH 7.2) at an OD600 of 0.1. Measurements were performed at 25 °C in a Zetamaster instrument using the PCS 1.27 software (Malvern Instruments Ltd., Malvern, UK) and the settings of aqueous solutions (viscosity = 1.002 cP; dielectric constant = 80.4), in plain buffer. Sensitivity to the bactericidal action of nonimmune serum was determined as follows: exponentially growing bacteria were adjusted to 2 × 104 CFU/mL in PBS and dispensed in microtiter plates (50 μL/well) containing fresh normal calf serum or serum previously heated at 56 °C for 60 min to remove complement (150 μL/well). After incubation for 3 h at 37 °C, 50 μL of each sample was plated TSA-YE-S by triplicate, and the results are expressed as the proportion between the organism cultivable after exposure to normal nonimmune serum and those cultivable after the exposure to serum in which complement had been heat inactivated. Sensitivity to polymyxin B (Sigma-Aldrich Ltd.) was determined as described before []. Female 8–10 week-old BALB/c mice (Charles River International, France) were used. They were randomly distributed and accommodated in the animal facilities of Universidad Pública de Navarra (registration code ES/31-2016-000002 CR-SU-US) for 1–2 weeks before starting and during the assays, with water and food ad libitum. The procedures performed with mice were designed according to national (RD 53/2013) and European (EU directive 2010/63) legislations regarding the use of animals in research. Mice inoculations were carried out with 0.1 mL of bacterial suspensions previously adjusted to an OD600 of 0.170 (around 1 × 109 CFU/mL) and then diluted to the appropriate dose (see below) in sterile PBS []. Exact inoculation doses were determined retrospectively by plating tenfold dilutions prepared in PBS on BAB-S or TSA-YE-S.
For virulence, BALB/c mice (n = 10) were inoculated intraperitoneally (IP) with 5–7 × 105 CFU/mouse of the corresponding B. ovis PA mutant strain, and viable spleen counts were determined (n = 5) at 3 and 10 weeks post-inoculation as previously detailed []. As a control, additional groups of mice (n = 10) were inoculated similarly with the virulent B. ovis PA reference or the sibling reverting strains, to control for the potential for incidental attenuation during the manipulation required for mutagenesis. The identity of the spleen isolates was confirmed throughout the experiment by both PCR and B. ovis phenotypic features []. Spleen infections were expressed as mean ± SD (n = 5) of individual log10 CFU/spleen at the times indicated []. Efficacy of the BoΔwadB and BoΔwadC mutants as vaccines was evaluated in BALB/c mice (n = 10) vaccinated intraperitoneally with 1 × 108 CFU/mouse of the corresponding B. ovis mutant strain, or subcutaneously (SC) with 1 × 105 CFU/mouse of B. melitensis Rev 1 (as standard vaccinated control), or with 0.1 mL of PBS (pH 6.8) as the unvaccinated control. Four weeks after vaccination, all mice were challenged intraperitoneally with 5 × 105 CFU/mouse of the virulent B. ovis PA-GmR (Table 1), and the number of challenge bacteria in spleens was determined 3 weeks afterwards []. Differentiation between challenge and residual vaccine bacteria was performed by duplicate plating on BAB-S and BAB-S supplemented with Gm. Results are expressed as the mean and SD (n = 10) of the individual log10 CFU/spleen of B. ovis PA-GmR challenge strain. Statistical comparisons of mean log10 CFU/spleen were performed by a one-way ANOVA followed by the Fisher’s Protected Least Significant Differences tests []. The virulence of the B. ovis PA-GmR challenge strain used in this work was proved in a previous experiment in BALB/c mice (n = 5) by intraperitoneal infection (5 × 105 CFU/mouse) and bacterial spleen counting at 3 weeks later. This strain showed identical bacterial counts in BAB-S and BAB-S supplemented with Gm, and identical multiplication to that of B. ovis PA in mice (not shown). Several ORF encoding putative glycosyltransferases have been shown to be involved in the biosynthesis of the core of B. abortus LPS: wadA (formerly named wa**, BAB1_0639, [,]), wadB (BAB1_0351, [,]) and wadC (BAB1_1522, [,]). We searched for orthologues of these glycosyltransferases in the B. ovis strain ATCC25840 genome sequence and we identified three ORF: BOV_0614 for wadA, BOV_0337 for wadB and BOV_1453 for wadC, with 99.4%, 99.9% and 100% DNA sequence identity, respectively. Non-polar mutant and sibling revertant strains were obtained for each target gene from B. ovis PA strain as described in the Materials and methods section. PCR amplification and sequencing of the target loci in the genome of the mutants confirmed inactivation of the respective genes (data not shown). All mutants behaved like the parental strain in classical bacteriological typing for the genus Brucella [] and showed no differences in growth patterns when compared to the parental strain B. ovis PA (data not shown). For the analysis of possible LPS defects, we extracted B. ovis LPS using a SDS-proteinase K protocol []. Tricine SDS-PAGE resolved the LPS of the parental strain B. ovis PA into at least three major components I, II and III (Figure 2A), and the same migration pattern was obtained with the BoΔwadA mutant and the sibling revertant strain (not shown). However, component I was absent from LPS of mutants BoΔwadB and BoΔwadC, which also showed increased relative proportions of component II, suggesting a deficiency in the LPS oligosaccharide structure. The corresponding blots were probed with anti-R-LPS MAbs A68/10A06/B11, A68/24G12/A08, and A68/24D08/G09 (Figure 2B). The lack of reactivity of these MAbs with the LPS of mutants BoΔwadB and BoΔwadC confirmed the absence of part of the oligosaccharide. In contrast, no defect could be detected in the LPS of mutant Bo∆wadA by this method. LPS characterization. 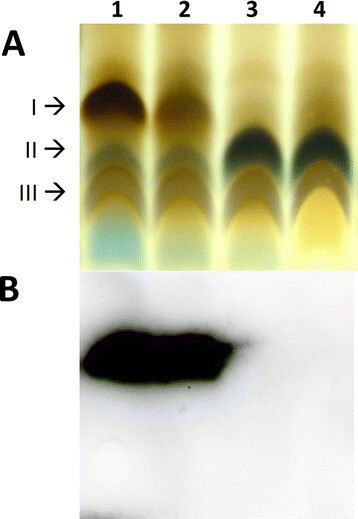 Tricine SDS-PAGE (A) and Western-blot (B) analysis of the LPS of B. ovis PA (1) and the LPS mutants BoΔwadA (2), BoΔwadB (3) and BoΔwadC (4). Arrows point the components I, II and III found by migration in the gel. The antibody used in the blot shown (B) is anti R-LPS A68/10A06/B11. Western blot probed with A68/24G12/A08, and A68/24D08/G09 gave similar results (data not shown). Several differences were found between two B. ovis LPS gene deletion mutants and the parental strain with regard to their reactivity with MAbs specific for R-LPS and Omps. When probed with anti-R-LPS antibodies, differences in reactivity suggestive of changes in epitopic structure and/or exposure were found: mutants BoΔwadB and BoΔwadC showed decreased reactivity while mutant BoΔwadA had levels of reactivity similar to those of the parental strain (Figure 3A). In addition, the binding of anti-Omp MAbs to both BoΔwadB and BoΔwadC mutants revealed significant differences compared to the parental strain: while BoΔwadB reacted more strongly with MAbs against the major Omps Omp25, Omp31 and also the lipoproteins Omp16 and Omp19, BoΔwadC had decreased reactivity with all the anti-Omp MAbs (Figure 3B). 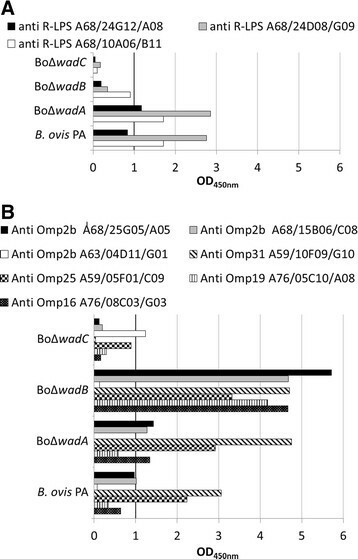 Similarly, the anti-Omp2b MAbs A68/25G05/A05 and A68/15B06/C08 bound more strongly to BoΔwadB than parental B. ovis PA, and very low levels of reactivity with Bo∆wadC; however, the anti-Omp2b MAb A63/04D11/G01 displayed increased binding to Bo∆wadC and a low binding to BoΔwadB. These results suggest that the defects in the LPS oligosaccharide of both mutants are different and affect the exposure and/or conformation of the major Omps also in a different way. The MAb reactivity of the major Omps in the BoΔwadA mutant was similar to that of the parental strain in all the MAbs tested except the antibody directed against Omp31 A59/10F09/G10 which showed an increased reactivity (Figure 3B). Outer membrane epitopes in B. ovis PA and the LPS mutants. Reactivity with MAbs anti R-LPS (A) and anti Omps (B) was measured by ELISA. Autoagglutination is a property characteristic of some Brucella R mutants. Parental B. ovis PA, BoΔwadA and all the sibling revertant strains showed autoagglutination, with a 90% reduction of the initial OD600 value in a few hours. On the contrary, mutants BoΔwadB and BoΔwadC remained in suspension for at least 48 h (Figure 4). This effect correlated with an increase in negative surface charge (Zeta potential, Figure 5). We also studied whether the resistance to complement-mediated killing in normal serum typical of brucellae was affected by the mutations []. We found that, whereas the parental strain B. ovis PA, BoΔwadA and the sibling revertant strain were resistant to non-immune serum (survival percentages of 93.0 ± 5.5, 92.0 ± 4.8, 101 ± 6.9, respectively), BoΔwadB and BoΔwadC mutants were significantly (p < 0.05) affected (survival percentages of 74.0 ± 3.9 and 68.0 ± 3.2, respectively). On the contrary, polymyxin B resistance, another important envelope property of brucellae, was not significantly affected (not shown). Autoagglutination properties of B. ovis PA and the LPS mutants. Results are the mean ± SD of three independent experiments. Sibling revertant strains behaved as the parental strain (data not shown). Surface charge (Z potential) of B. ovis and the LPS mutants. Results are the mean ± SD of ten independent experiments. BoΔwadC-rev is the sibling revertant strain of the BoΔwadC mutant, and the same results were obtained with BoΔwadB-rev (not shown). The colonization and persistence of B. ovis LPS gene deletion mutants in the spleens of mice was evaluated at 3 and 10 weeks after intraperitoneal infection with 5–7 × 105 CFU/mouse. 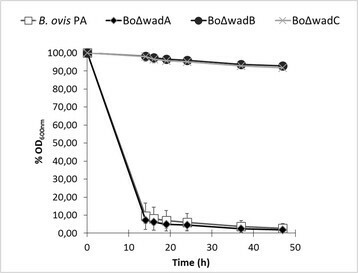 While the infection produced by BoΔwadA reached the levels of infection of B. ovis PA, mutants BoΔwadB and BoΔwadC showed significant (p < 0.005) attenuation (Table 3). In fact, the splenic concentrations reached by the latter mutants at 3 weeks post-infection (i.e. the time-point at which peak splenic concentrations are reached by virulent strains) were significantly (p < 0.005) lower than that reached by the parental strain. Thereafter, at 10 weeks post-infection, BoΔwadA persisted at the levels of the parental strain while BoΔwadB and BoΔwadC mutants showed significantly (p < 0.005) reduced persistence, being practically cleared from the spleens in most of the inoculated mice (Table 3). Such significant attenuation was not attributable to the mutagenesis procedure, since both sibling revertant strains reached and maintained levels of splenic infections similar to those reached by the parental strain (Table 3). Statistical comparison (n = 5) of mean log CFU/spleen or percentage of mice found free from infection in spleens by totals, respectively: aP < 0.005 vs. B. ovis PA; bSibling revertant mutants. 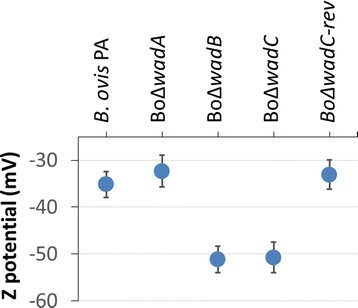 The efficacy of BoΔwadB and BoΔwadC as vaccines was studied in mice challenged with B. ovis PA. As shown in Table 4, these two mutants conferred significant protection with respect to the unvaccinated controls. However, the protection conferred by BoΔwadB was the most effective one, improving significantly (p < 0.05) that conferred by others at standard conditions, and even preventing the virulent infection in 7 out 10 mice (Table 4). ap < 0.005 and , bp < 0.05 vs. unvaccinated control; cp < 0.05 vs. Rev 1 control. Several differences have been shown in the structure of the LPS among the different species of the genus Brucella [–]. Wild-type B. melitensis, B. abortus, B. suis, B. neotomae, B. ceti, B. pinnipedialis and B. microti produce a S-LPS where the O-polysaccharide is linked to the core oligosaccharide. However, B. ovis and B. canis lack this O-polysaccharide thus producing an R-LPS. The genetic bases of this R phenotype have been partially described []. In B. ovis, the genome shows a 15 Kb deletion which includes genes wboA and wboB [,], both involved in the synthesis of the O-polysaccharide, and several point mutations generating nonfunctional proteins, wbkF and wzt among others [], involved in bactoprenol priming (see also below) and export of the O-polysaccharide to the periplasm, respectively. The structures of the core and repeated O-polysaccharide fragments of B. abortus biovar 4, B. melitensis biovar 3 and B. suis biovar 4 obtained after acid hydrolysis of S-LPS have been recently published []. The structure available for the core oligosaccharide (Figure 1) shows the existence of a side oligosaccharide chain composed of four residues of glucosamine, plus glucose and mannose, the latter linked to Kdo I, with Kdo II linked to another glucose from which the O-polysaccharide stems. Although the precise structure of LPS of B. ovis remains to be determined, a previous immunochemical assay carried out with R-LPS extracted from B. ovis REO198 found fragments that were estimated to contain 2, 4, 6 and 7 sugars, including glucose, mannose, glucosamine, Kdo and an unidentified sugar []. Up to now only three glycosyltransferases have been shown to be involved in the synthesis of the LPS core in B. abortus and B. melitensis (wadA, wadB and wadC), and B. ovis carries the corresponding orthologous ORF. Although the homology of these glycosyltransferases suggests that the composition of B. ovis core LPS is similar to other Brucella species, antigenic and immunochemical analyses of LPS extracts have showed differences [,]. In B. abortus and B. melitensis, the deletion of wadA results in an R phenotype and an altered LPS core [,]. In B. melitensis, the wadA mutant carries a defective LPS core but also synthesizes a free cytoplasmic O-polysaccharide, which strongly suggests that wadA codes for a glycosyltransferase involved in the synthesis of the core section linked to the O-polysaccharide []. Taking into account previous electrophoretic analysis of the R-LPS, wadA is likely to encode the enzyme involved in transferring the glucose linked to quinovosamine [] (Figure 1). In the case of B. ovis, the reactivity with MAbs, the cell surface properties, the electrophoretic analyses of the LPS and the virulence assays all showed a similar behavior for mutant BoΔwadA and the parental strain. Quinovosamine, absent in B. ovis REO 198 LPS [], is in all likelihood the sugar priming bactoprenol for O-polysaccharide synthesis [], and B. ovis carries mutations in wbkF, involved in bactoprenol priming, so LPS oligosaccharide lacks a terminal glucose in the wadA mutants. Such a small defect would be consistent with the fact that the B. ovis ΔwadA mutant was practically indistinguishable from the parental strain. Although the LPS core of B. abortus and B. melitensis mutants is altered, the O-polysaccharide remains in place [5–7 and Conde R., Arce-Gorvel V., Iriarte M., Gorvel J.P. and Moriyón I., unpublished results]. This evidence shows that glycosyltransferases WadB and WadC are responsible for the synthesis of the glucosamine rich oligosaccharide stemming from Kdo II (Figure 1). Specifically, it has been proposed that WadC could be implicated in the transfer of the first mannose to the lateral chain, while WadB would transfer other sugar [,]. In B. abortus, both mutants induce a pro-inflammatory response higher than that of wild-type bacteria and are thus attenuated in dendritic cells and mice [–]. Moreover, they are more sensitive to the bactericidal action of the nonimmune serum and cationic peptides [,]. It has also been proved that the core defect enhances recognition by the TLR4-MD2 receptor/co-receptor system and, accordingly, a glucosamine-rich branch of the LPS core of the B. abortus and B. melitensis acts as a shield against recognition by several innate immune systems, thus representing a virulence mechanism of these Brucella spp. []. In B. ovis, the LPS of the mutants ΔwadB and ΔwadC lacks a part of the core oligosaccharide (component I in Figure 2) and the defects generate a marked increase in the negative value of zeta potential that can be explained by the loss of all or part of the positively charged glucosamine residues (Figure 1). The attenuation observed for mutants BoΔwadB and BoΔwadC show for the first time that the LPS of a naturally R Brucella pathogenic species (i.e. B. ovis) is essential for survival in the mouse model. Even though the exact mechanism remains to be elucidated, the proposed core defect is likely to facilitate the recognition of B. ovis LPS by innate immunity. Indeed, this hypothesis is supported by the above-summarized results obtained with the homologous B. abortus and B. melitensis mutants and with the fact that, rather than the O-polysaccharide, it is the lipid A-core overall structure that is recognized by multiple innate immunity systems [–,,]. Nevertheless, other effects cannot be disregarded because the mutants BoΔwadB and BoΔwadC were affected not only in the LPS but also in the topology of the outer membrane as detected with anti-Omp MAbs. Little is known about how these changes may affect the virulence of brucellae but it has been shown that not all the B. melitensis R mutants are equivalent in their surface properties and outer membrane topology, and that they have different levels of interaction with host cells, virulence and vaccination power [,]. Recently, Conde-Álvarez et al. [] proposed a new strategy to develop vaccines against brucellosis based on the concept that the surface molecules of Brucella effectively evade a prompt detection by innate immunity [], and that surface changes such as those introduced by mutations affecting the glucosamine branch of the core would overcome hampered recognition thus producing a protective Th1 response. This concept was based on a comparison of a B. abortus wadC mutant and the current vaccine B. abortus S19 in the mouse model []. Although we have not evaluated the immune response in this work, our results add further weight to the value of this strategy and show the possibility of obtaining vaccines against brucellosis caused by B. ovis that could be used in areas free of B. melitensis. However, a potential defect of these vaccines would be their interference in the diagnosis of B. ovis, which is carried out using tests that detect antibodies to both Omp and R-LPS []. These problems, however, could be circumvented by the use of antigenically-tagged brucellosis vaccines, a strategy recently shown to be effective for the vaccine B. abortus S19 in the mouse model []. Research is in progress to evaluate all these possibilities in sheep. This work was funded by Ministerio de Economía y Competitividad of Spain (reference project AGL2011-30453-C04) and Fundación para la Investigación Médica Aplicada (FIMA). Financial support to PS-L from Ministerio de Economía y Competitividad of Spain (reference BES-2009-015656), AZ-B from Universidad Pública de Navarra, and BSR from CSIC and European Social Fund (Programa JAE-Doc) are also gratefully acknowledged. MI and IM are co-owners of the patent “Modified Gram-negative bacteria for use as vaccines” (N°PCT/EP2010/063921 [WO2011/033129]) that covers the use of Brucella LPS core genes. PS-L carried out the experiments and participated in the design of the study and draft of the manuscript. YG-R, AZ, MI, RC-A and NV collaborated with the design and construction of the mutants. MZ and AC helped with the immunochemical studies and the characterization of the LPS. M-JG, AZ-B and BSR participated in mice in vivo studies. IL-G and IM conceived the study, participated in its design, coordinated the work and helped to draft the manuscript. All authors read and approved the final manuscript.